Sing a song of stormy oceans and oat upon the calming seas with the Nautila Chorus/Flanger. Create never before heard tidal swirls or soothing rhythmic waves with the Voice and Drift controls. These controls allow you to add up to eight chorus or four anger voices and then blend and morph the waveforms in real-time with the Drift knob. Alter the modulation speed in real-time by holding down the momentary foot switch and then release to continue on your voyage through the currents. Buy Now: https://goo.gl/qa6ssC Today we're dipping into the Nautila, from DigiTech. The Nautila is a full-power chorus and flange machine that gives you control over parameters you've never dreamed of across two modes, with some hidden extras mixed in. Before getting wet, the toggle on top selects the mode, and then the waters open up. The drift control cycles continuously between three different LFO waveforms, selecting any one of them or a combination of both for some unexplored LFO options. Speed and depth controls come standard, with an enhanced range, and the mix knob provides subtle movement behind your signal all the way through hazy, psychedelic vibrato. 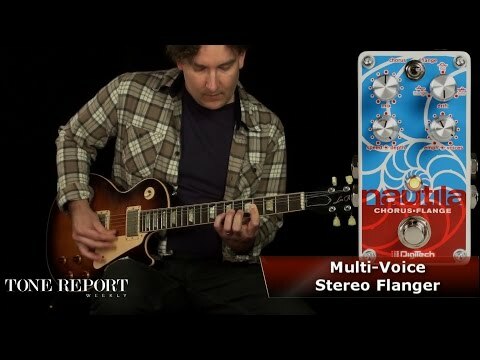 A unique voices control adds any number of voices to the modulation signal, up to eight voices for chorus and four flanger voices. The emphasis control changes depending on mode. In chorus mode, the knob gives you control over the tone of the chorus voices, and in flange mode, it controls the regeneration of the flanger signal. The speed knob works in tandem with the footswitch. When the speed control is set in the slow range, pressing and holding the footswitch will ramp up the speed until the switch is released. When set in the fast range, the speed will grind to a halt when the switch is held. To take full advantage of this powerful chorus and flanging, the Nautila is equipped with true stereo outs with no awkward TRS cables required, lending a truly immersive experience to players with stereo setups or routing schemes.